When I heard Drew Barrymore was going to star in her very own Netflix original, I was pumped. I absolutely love her (always have)! She's very funny, but she's also very good in dramas and thrillers, so I knew regardless of the show's topic, I would love it! That was definitely true. Andre and I binged The Santa Clarita Diet in just a day. 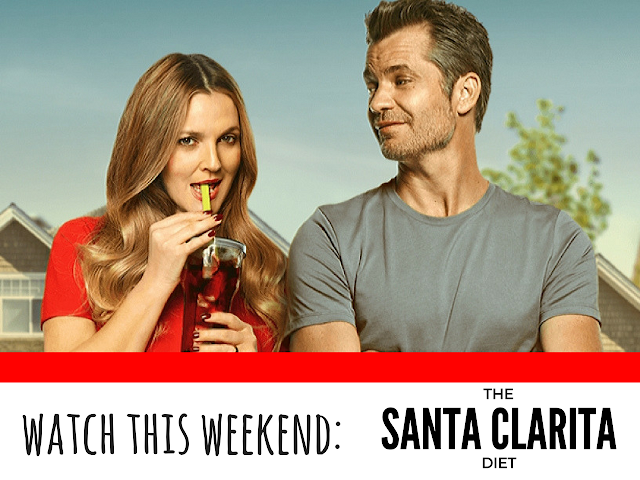 The Santa Clarita Diet is about a Californian couple, Sheila and Joel (Drew Barrymore & Timothy Olyphant) and their daughter. While showing a home (they're both realtors), Sheila gets crazy sick and dies. But does she? She becomes one of the undead. So, it's a zombie show, you ask? The short answer is yes, but it's not like a zombie show you've ever seen before. She's still mostly herself, but with less self control. As you can imagine, hilarity ensues. We literally could not stop watching. Not to mention there are only 10 episodes and they're less than 30 minutes each. I won't tell you how it ends, but I will say that it definitely leaves the series open for another season. You definitely want to watch it. Have you watched The Santa Clarita Diet on Netflix yet? I had NO idea what this was about but was intrigued because Drew Barrymore is the best! I'm going to have to watch! I loved the first season! My boyfriend loves Timothy Olyphant and was really excited for it. I was skeptical at first because I am not a fan of gore...but I was so pleasantly surprised. I laughed out loud through every episode. We binged in a day too, and are impatient for the next season! YES! The show is really laugh-out-loud funny and I can't wait for more episodes.